ROBERT ERRIDGE. From the date of his marriage, Richard is thought to have been born about 1670. We have found no evidence of his baptism. Findmypast has six records of his marriage to Elizabeth Makeney in 1695: the register of St Alphege, Canterbury, and five marriage indexes. His residence is given as “Kingston”. This is almost certainly Kingsdown, which is at the foot of the white cliffs on the Kent coast, just south of Walmer. He gave “Kingsdown in the parish of Ringwould” as his place of residence in his will. We have no information about Robert’s parents. Many of the Erridges of Kingsdown were mariners, but we know from his marriage licence that Robert was a yeoman. He appears to have come from a family of above average means. At his death he left well over £100, possibly nearer £200. ELIZABETH MAKENEY is almost certainly the daughter of Sidrach and Ann Makeney, since she called one of her sons Shadrack. She was baptised in the village of Ripple, a village just south-west of Deal, on 4 September 1666. This was the year of the Great Fire of London. There is another Elizabeth baptised in Ripple in 1662. She was the child of John Makeney and was probably the younger Elizabeth’s cousin. There a number of variant spellings of this surname in Kent, but Makeney was the one used in Ripple. In both cases, the parish of residence was said to be Rodmersham, which is 26 miles from Ripple, between Sittingbourne and Faversham in North Kent. We have found no other evidence of Makeneys in Rodmersham. No baptisms of siblings have been found in Ripple or elsewhere. Either Elizabeth was an only child, or the family lived in another parish before or after her birth. Her mother may have died in childbirth. Ripple and Kingsdown are only two miles apart, giving Robert and Elizabeth plenty of opportunity to meet. Elizabeth was 29 when she married. At her marriage, her residence is variously given as Canterbury, perhaps because she married there, and Ringwould. Ringwould is a mile west of Kingsdown. Robert and Elizabeth were married by licence. The wedding took place on 6 November 1695 at St Alphege’s church in Canterbury. It may have been because Elizabeth was working in Canterbury. She is entered in the marriage register there as Mackeney. 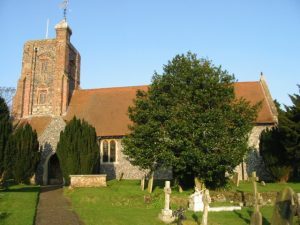 The couple may have lived at Kingsdown, but their six children were baptised at St Nicholas church in Ringwould, which stands on high ground a mile or so inland from Kingsdown. Shadrack married Mary Bewles, 25 December, 1725 at Wingham. He is said to have died in 1793, though that may have been a younger Shadrach. Robert married Mary Wood at St Margaret’s Canterbury, 18 Oct 1727. Edward married Amy, surname unknown. Elizabeth senior died before her younger children were married. She was buried at Ringwould on 10 May 1731. She was 64. Sarah married John Clayson in 1732. Edward married Amy before 1737. Three days before he died, Robert made his will. He gave his place of residence as Kingsdown. He appears to have been a man of some means. He left his eldest son Robert £50. His daughter Elizabeth, then unmarried, received £30. The youngest, Sarah Clayson received £20. His son-in-law Mark Redman, husband of Anne, owed Robert £5. Robert cancelled the debt. £20 was to be shared equally between the six Redman children, each of them receiving £3.6.8d when they reached the age of 18. After the payment of these bequests and the funeral and probate costs, the remaining money and personal effects were to be shared equally by Shadrack and Edward, who were appointed executors. The will was proved on 1 July 1738. Elizabeth junior married George Pittock in 1738. She is said to have died in 1797. Again, her great age, if that were true, makes us wonder if this was another Elizabeth.